Yet another ODI series bit the dust when Pakistan lost the series decider against New Zealand on Friday in Abu Dhabi, and found themselves at number 7 in the ODI ranking. Yes, Pakistan. At number 7! I don't remember Pakistan ever having such a bad ODI team. During the 80s and 90s, Pakistan had their strongest ever team in ODIs, which played the semi finals of the 1983 and 1987 World Cups and the finals of the 1992 and 1999 World Cups. During the first decade of this century however, the team went through a decline after high profile retirements and probably had their worst ever decade in ODI cricket. For the first time in their history, Pakistan failed to qualify to the second round of a World Cup in 2003. They repeated that feat in 2007 as well! Things seemed to look brighter in this second decade of the 2000s as Shahid Afridi led a young Pakistan team into the semi finals of the 2011 World Cup. However, soon after the World Cup, the ever so dynamic and shrewd management of the PCB and the team decided that Afridi was no good to captain and replaced him with Misbah Ul Haq. Only in Pakistan will a captain who leads his team to the semi final of a World Cup find himself axed for someone who was partly responsible for Pakistan losing that semi final. Since then, Pakistan's ODI cricket has been absolutely pathetic! 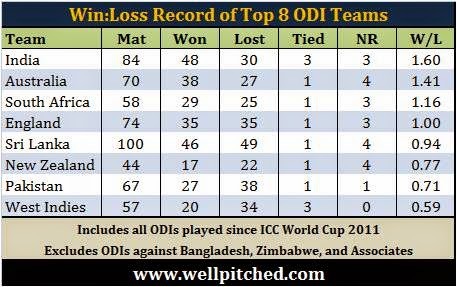 It doesn't take a genius to realize that Pakistan's ODI team has the worst record among the top 8 ODI teams, barring West Indies, over the past 4-year period since the 2011 ICC World Cup. In all ODIs played among the top 8 teams since the last World Cup, Pakistan's W:L ratio of 0.71 is better than only that of the West Indies. The problem is not that Pakistan has performed badly; the problem is that everyone knows that it has, yet neither the Board, nor the Management, has done anything about it! The same culprits continue to play for Pakistan losing game after game, series after series, yet no one brings about changes in personnel. Does anyone remember the XI that Pakistan played in semi final of the World Cup in 2011? 8 of those 11 players from Pakistan played in the just concluded ODI series against New Zealand. Of the 3 that missed it, one is banned, while the other two have been dropped, with one of them standing a good chance of being back for the upcoming ICC World Cup 2015. On the other hand, the team that won that World Cup in 2011, have dropped as many as 5 of the players who played that Semi Final against Pakistan and the Final against Sri Lanka. Now I know that what applies to one team does not necessarily apply to other teams, but bad form must be equally weighed across all teams. Yet for some reason, Pakistan has no accountability whatsoever! Asad Shafiq has played 37 ODIs for Pakistan scoring 804 runs at an average of 22.97. Younis Khan has played 38 ODIs scoring 964 runs at an average of 29.21. Wahab Riaz has played 29 ODIs and has taken 30 wickets at an average of 41.3. Umar Gul has played 37 ODIs and has taken 40 wickets at an average of 37.1. And these players continue to be a part of Pakistan's ODI plans for the upcoming World Cup! Where is the planning? Where is the management? Who is taking these decisions? Does no one realize that they are severely hampering Pakistan's ODI cricket? It is not that Pakistan does not have the talent to play ODI cricket. They have found some seriously talented batsmen in the past 4 years. Ahmed Shehzad has played 42 ODIs, scoring 1577 runs at an average of 37.5. Fawad Alam has played 8 ODIs, scoring 345 runs at an average of 69. Sohaib Maqsood has played 18 ODIs, scoring 572 runs at an average of 35.8. Umar Akmal has played 65 ODIs, scoring 1614 runs at an average of 35.9. Nasir Jamshed has played 33 ODIs, scoring 1060 runs at an average of 33.1. Azhar Ali has played 14 ODIs, scoring 452 runs at an average of 41.1. And believe it or not, but only two, or at max three, of these batsmen will be on that plane to Australia in January for the ICC World Cup 2015. Actually, knowing Pakistan's management, maybe only one of these batsmen will be going to Australia. For fours years the World has seen the likes of Younis Khan and Asad Shafiq fail in ODIs repeatedly. For four years the World has seen Hafeez struggle against top quality fast bowling repeatedly. For fours years the World has seen Misbah grind it out without converting his starts into anything substantial repeatedly. Yet our Board and Management continue to keep their faith in these legends of ODI cricket and continue to play them game after game, series after series. It was unfortunate that Sohaib Maqsood got injured. But is there any justification for any batsman to be playing an ODI for Pakistan ahead of Umar Akmal and Fawad Alam? Is there any justification for Younis Khan and Asad Shafiq to be a part of ODI plans ahead of Azhar Ali? Pakistan's ODI cricket is in the worst stages of its history and the only people to blame here are the people responsible for managing it. The Board has done a disastrous job. There has been very little thought process. In an era where teams attack from the get go and pile on the runs at 5-6 an over, Pakistan has continued to play a long forgotten form of ODI cricket where they score at 3 runs an over and keep wickets in hand for the end. Someone needs to tell them that this form of ODI cricket does not work for them any more. While it may work when batting first, it definitely does not work when chasing a total, because Pakistani batsmen easily buckle under the pressure, and they don't have many players who can chase at 6-7 per over. They don't play the players who can chase at 6-7 runs per over. Pakistan will announce the team for the World Cup by January 12th after the conclusion of the domestic ODI tournament, which the selectors are saying will be watched carefully in order to decide the best 15 players for the World Cup. You know what will happen in this domestic ODI tournament? Kamran Akmal and Shoaib Malik will score heaps of runs and the selectors will decide to include them in their 15 for the World Cup. One as a reserve opener and the other as a batsman who can bowl, due to the ban on Mohammad Hafeez. And Pakistan's ODI team will continue to remain Absolute Rubbish!